However, I did take a little break over the past two weeks as I kinda had my head buried in some business development. As we head into summer break, I thought it was a good time to review how my business was doing for the first half of the year and how I wanted things to go. For the past 6-8 months I’d been felt pushed, by others in my industry and my husband, that in order to grow my business, I should be looking at growing my team, basically growing into an agency. For years I have resisted this as I didn’t want to grow huge and have to manage a big team. I did do some things to restructure over the last year, as you’d seen – switching to use my business website, creating custom website packages, etc. The path I was heading down though, felt alien and wrong to me for some reason and I had this strong feeling in my gut that it wasn’t the right path for me. See, I love working with my clients on a personal level. Knowing that I’m making a difference in your business by providing you with an amazing website that you love, that will help position you as the authority in your industry. I want to do more of that, yet on a grander scale. I’d like to introduce to you my new website/branding/message. 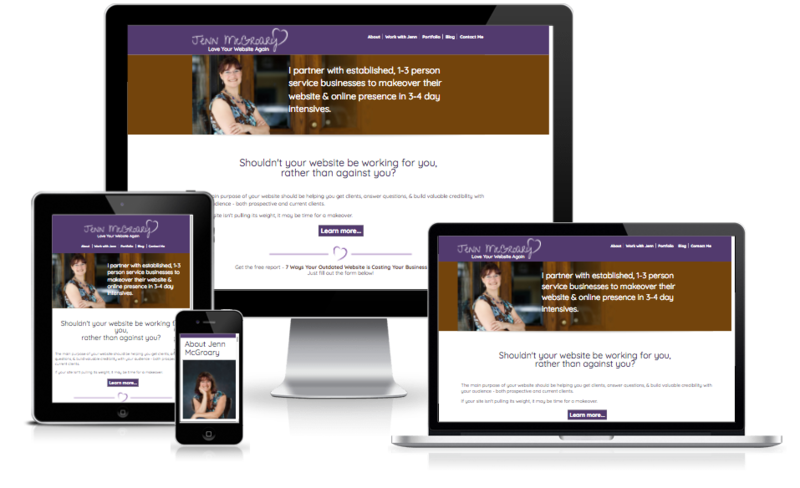 I partner with established, 1-3 person service businesses to makeover their website & online presence in 3-4 day intensives. I have a specific process I take my clients through that allows for a simplified, consistent, fast outcome that gives greater value and results for my clients. I do this by only working with one client at a time, thereby allowing me to fully focus on only their project. If this is something that speaks to you, please drop me an email so we can discuss. Well written blog! Your assessment makes a lot of sense! Sounds like a perfect “fit” for you to follow your gut!! You are an extremely talented woman who Excells in your work & in your family! !